If it happened in the U.S., we’d have already anointed it as the second best story in the history of sports, just behind the Miracle on Ice. And to be honest, it’s equally impressive. It’s the ultimate underdog movie (Think Hoosiers on steroids – not the players, but the plotline), but since Leicester City happens to be in the U.K. – in the East Midlands of England to be precise – their football club’s moment in the American sun has quickly passed. And oh yeah, it’s not a movie. It actually happened. A year ago Leister City Football Club showed every sign of being relegated back out of the Premier League. They spent 140 days of last season in last place. Now, a year later, these 5000-1 shots pulled off the unimaginable by winning the English Premier League – with a week to spare no less. That’s right, the team that was predicted to finish dead last in the twenty-team league went out and won the whole darn thing. It’s impossible to label it as just a story – singular – because this big and wonderful story is sort of like a piñata filled with all these smaller but equally wonderful stories. And I’m not kidding. You can’t swing a dead cat around this story without hitting a Disney moment. The narrative is rich with tales of swashbuckling heroics and sublime redemption, culminating with the club’s first top-flight title since its inception a mere 132 years ago. I mean, if you tried to pass this off as a work of fiction, you’d be arrested for extreme cliché and reckless use of fantastical cheesiness. These smaller stories are too numerous to list, but just to give you a taste – there was the miracle before the miracle, the miracle finish to the 2014-15 season, the one that set up the 2015-16 miracle, and it all began with… wait for it… a disinterred king. Yeah, you read that right. A king who was unburied then reburied. Leicester’s run of survival in the Premiership began with King Richard III’s second funeral, when the royal was re-buried at Leicester’s Anglican Cathedral. Four days later, the downtrodden Foxes began their surge with a 2-1 win over West Ham thanks to late goal by a substitute named Andy. 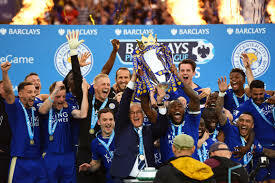 That goal sparked Leicester’s climb to survival as the club won seven of its final nine games (it had only won four up to that point), enabling it to maintain a spot in the league which it would go on to win a year later. So yeah, there’s a lot going on with this one. I feel compelled to mention just one more of these smaller stories within the story because the coincidence is just too good not to share. About a year ago I published a book called Shutout Pizza – Smarter Soccer Defending for Players and Coaches. If you haven’t read it, you may have noticed that there’s a word that seems a little out of place for a book about soccer defending… or soccer anything really. Well I wanted weave a cool little story into my defending book – a backdrop really – to give it a touch of personality. So how does Shutout Pizza the book title tie into one of the most magnificent stories in the history of sport? Well that’s where this other-worldly coincidence comes in. Early in the Premier League season, Leicester City was winning games, but they were hemorrhaging goals. Their manager, Claudio Ranieri, begged his boys for shutouts, but the shutouts weren’t coming. So before a match against Crystal Palace, Ranieri told his players that if they notched a clean sheet that day, he would take them out for pizza. Sure enough, in their eighth Premier League match, LCFC finally delivered its first shutout of the championship campaign. No shutouts before the pizza. Fifteen after it. Yeah, go ahead and try demystifying that one. And if you don’t believe me, just check out this article written by Ranieri himself. I’d stopped watching soccer on television a few years back, mainly because so much of my life was already consumed by watching video of college games. But this year I decided to end my embargo – another fine coincidence –which allowed me to watch this story unfold. In the interest of full disclosure, Leicester City had never been my team. But there are thousands all over the world just like me, who loosened the leash on our allegiance to whichever club we support and allowed ourselves to be swept away by the euphoria of this sensational, once-in-many-lifetimes fairytale. Congrats to Leicester City FC, champions of the Premier League. It was, in a word, magical. If you enjoyed this entry, I hope you'll consider buying one of my books. Just click the links below.